This is another small bookmark which can be done with size 10 thread. This design is just a little cloverleaf with a chain around the outside. 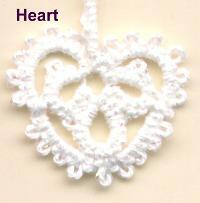 The heart shape is more pronounced if you make the picot at the point of the heart a little bit bigger than the other picots in the outer chain.